We are not going to talk about the Horned vs Disbudded debate here. It is briefly discussed in the section Choose Your Goats. Horns are not scurs and scurs are not horns. A horn is a naturally occurring appendage of the goat which is used for self-defense, sparring with herd members, and for helping regulate their internal body temperature. Scurs are small, rudimentary horn growths that occur sometimes after a goat is disbudded. Scurs are generally only attached to the skin, not the skull, so goats regularly cast them off by rubbing their heads on fences and by sparring with other goats. Scurs are most common in bucks, as the scurs are helped along via testosterone. 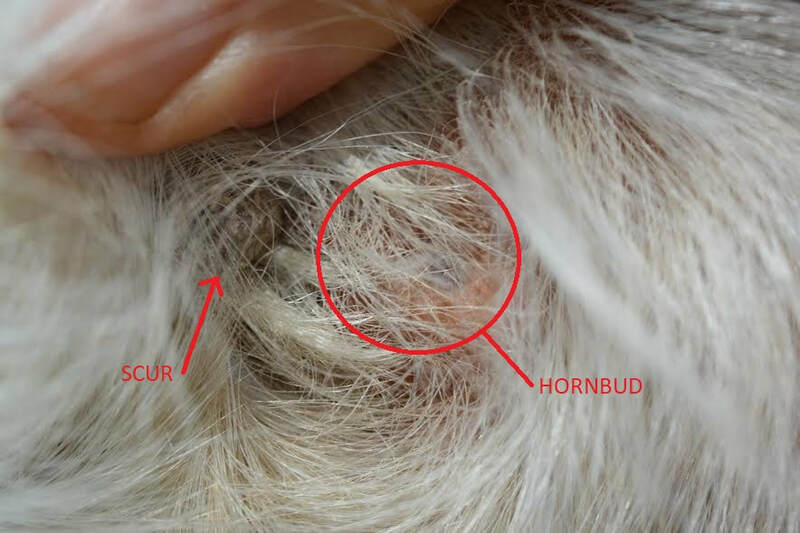 Most scurs occur in front of the hornbud, but they can occur other places. The picture at the left is hard to see, but if you look closely, you can make out the pink of this buckling's healed hornbud. There is a grayish-white structure to the right, and that is a small scur. Some new goat owners mistake the scur for a horn growing back. Scurs are not horns, and they do not grow in the same place that horns would grow. Scurs are nothing to be alarmed about, and goats usually do not have them for very long. If a scur gets too long, you can band them with rubber bands and they will fall off. Causes of scurs on does include disbudding too late, and disbudding incorrectly. Some bucks will grow scurs no matter how thorough the disbudding job was. Disbudding correctly takes some practice. I remember when we first started doing it, we had scurs EVERYWHERE. Baby goats should be disbudded within the first ten days of life. Bucks generally need to be disbudded earlier than doelings. When you can feel the hornbuds they are ready to disbud. ​The following videos are republished with permission from Helmstead Minis. Frankly, the only reason I haven't made my own video of my husband disbudding, is because I can't be around during disbudding. The smell of burning hair makes me sick. Thank you for allowing me to share these, Ben and Kate Helms!